SUBHEAD: Having love for a place and its life make you want to preserve it and remain in it. 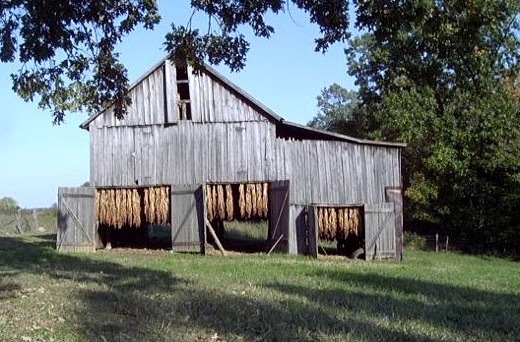 Image above: An old tobacco barn on a farm in Trigg County in western Kentucky. From (http://www.westernkyhistory.org/trigg/TCtobaccobarn.jpg). Note: This is the text of Wendell Berry's Jefferson Lecture for the National Endowment for the Humanities, which was delivered in 2012. One night in the winter of 1907, at what we have always called “the home place” in Henry County, Kentucky, my father, then six years old, sat with his older brother and listened as their parents spoke of the uses they would have for the money from their 1906 tobacco crop. The crop was to be sold at auction in Louisville on the next day. They would have been sitting in the light of a kerosene lamp, close to the stove, warming themselves before bedtime. They were not wealthy people. I believe that the debt on their farm was not fully paid, there would have been interest to pay, there would have been other debts. The depression of the 1890s would have left them burdened. Perhaps, after the income from the crop had paid their obligations, there would be some money that they could spend as they chose. At around two o’clock the next morning, my father was wakened by a horse’s shod hooves on the stones of the driveway. His father was leaving to catch the train to see the crop sold. The economic hardship of my family and of many others, a century ago, was caused by a monopoly, the American Tobacco Company, which had eliminated all competitors and thus was able to reduce as it pleased the prices it paid to farmers. The American Tobacco Company was the work of James B. Duke of Durham, North Carolina, and New York City, who, disregarding any other consideration, followed a capitalist logic to absolute control of his industry and, incidentally, of the economic fate of thousands of families such as my own. “Boomer” names a kind of person and a kind of ambition that is the major theme, so far, of the history of the European races in our country. “Sticker” names a kind of person and also a desire that is, so far, a minor theme of that history, but a theme persistent enough to remain significant and to offer, still, a significant hope. Stickers on the contrary are motivated by affection, by such love for a place and its life that they want to preserve it and remain in it. Of my grandfather I need to say only that he shared in the virtues and the faults of his kind and time, one of his virtues being that he was a sticker. He belonged to a family who had come to Kentucky from Virginia, and who intended to go no farther. He was the third in his paternal line to live in the neighborhood of our little town of Port Royal, and he was the second to own the farm where he was born in 1864 and where he died in 1946. We have one memory of him that seems, more than any other, to identify him as a sticker. He owned his farm, having bought out the other heirs, for more than fifty years. About forty of those years were in hard times, and he lived almost continuously in the distress of debt. Whatever has happened in what economists call “the economy,” it is generally true that the land economy has been discounted or ignored. My grandfather lived his life in an economic shadow. In an urbanizing and industrializing age, he was the wrong kind of man. In one of his difficult years he plowed a field on the lower part of a long slope and planted it in corn. While the soil was exposed, a heavy rain fell and the field was seriously eroded. This was heartbreak for my grandfather, and he devoted the rest of his life, first to healing the scars and then to his obligation of care. In keeping with the sticker’s commitment, he neither left behind the damage he had done nor forgot about it, but stayed to repair it, insofar as soil loss can be repaired. My father, I think, had his father’s error in mind when he would speak of farmers attempting, always uselessly if not tragically, “to plow their way out of debt.” From that time, my grandfather and my father were soil conservationists, a commitment that they handed on to my brother and to me. It is not beside the point, or off my subject, to notice that these stories and their meanings, have survived because of my family’s continuing connection to its home place. Like my grandfather, my father grew up on that place and served as its caretaker. It has now belonged to my brother for many years, and he in turn has been its caretaker. He and I have lived as neighbors, allies, and friends. Our long conversation has often taken its themes from the two stories I have told, because we have been continually reminded of them by our home neighborhood and topography. If we had not lived there to be reminded and to remember, nobody would have remembered. If either of us had lived elsewhere, both of us would have known less. If both of us, like most of our generation, had moved away, the place with its memories would have been lost to us and we to it—and certainly my thoughts about agriculture, if I had thought of it at all, would have been much more approximate than they have been. Because I have never separated myself from my home neighborhood, I cannot identify myself to myself apart from it. I am fairly literally flesh of its flesh. It is present in me, and to me, wherever I go. This undoubtedly accounts for my sense of shock when, on my first visit to Duke University, and by surprise, I came face-to-face with James B. Duke in his dignity, his glory perhaps, as the founder of that university. He stands imperially in bronze in front of a Methodist chapel aspiring to be a cathedral. He holds between two fingers of his left hand a bronze cigar. On one side of his pedestal is the legend: INDUSTRIALIST. On the other side is another single word: PHILANTHROPIST. After my encounter with the statue, the story of my grandfather’s 1906 tobacco crop slowly took on a new dimension and clarity in my mind. I still remembered my grandfather as himself, of course, but I began to think of him also as a kind of man standing in thematic opposition to a man of an entirely different kind. And I could see finally that between these two kinds there was a failure of imagination that was ruinous, that belongs indelibly to our history, and that has continued, growing worse, into our own time. To imagine is to see most clearly, familiarly, and understandingly with the eyes, but also to see inwardly, with “the mind’s eye.” It is to see, not passively, but with a force of vision and even with visionary force. To take it seriously we must give up at once any notion that imagination is disconnected from reality or truth or knowledge. It has nothing to do either with clever imitation of appearances or with “dreaming up.” It does not depend upon one’s attitude or point of view, but grasps securely the qualities of things seen or envisioned. I will say, from my own belief and experience, that imagination thrives on contact, on tangible connection. For humans to have a responsible relationship to the world, they must imagine their places in it. To have a place, to live and belong in a place, to live from a place without destroying it, we must imagine it. By imagination we see it illuminated by its own unique character and by our love for it. By imagination we recognize with sympathy the fellow members, human and nonhuman, with whom we share our place. By that local experience we see the need to grant a sort of preemptive sympathy to all the fellow members, the neighbors, with whom we share the world. As imagination enables sympathy, sympathy enables affection. And it is in affection that we find the possibility of a neighborly, kind, and conserving economy. Obviously there is some risk in making affection the pivot of an argument about economy. The charge will be made that affection is an emotion, merely “subjective,” and therefore that all affections are more or less equal: people may have affection for their children and their automobiles, their neighbors and their weapons. But the risk, I think, is only that affection is personal. If it is not personal, it is nothing; we don’t, at least, have to worry about governmental or corporate affection. And one of the endeavors of human cultures, from the beginning, has been to qualify and direct the influence of emotion. The word “affection” and the terms of value that cluster around it—love, care, sympathy, mercy, forbearance, respect, reverence—have histories and meanings that raise the issue of worth. We should, as our culture has warned us over and over again, give our affection to things that are true, just, and beautiful. When we give affection to things that are destructive, we are wrong. A large machine in a large, toxic, eroded cornfield is not, properly speaking, an object or a sign of affection. James B. Duke came from a rural family in the tobacco country of North Carolina. In his early life he would have known men such as my grandfather. But after he began his rise as an industrialist, the life of a small tobacco grower would have been to him a negligible detail incidental to an opportunity for large profits. In the minds of the “captains of industry,” then and now, the people of the land economies have been reduced to statistical numerals. Power deals “efficiently” with quantities that affection cannot recognize. It may seem plausible to suppose that the head of the American Tobacco Company would have imagined at least that a dependable supply of raw material to his industry would depend upon a stable, reasonably thriving population of farmers and upon the continuing fertility of their farms. But he imagined no such thing. In this he was like apparently all agribusiness executives. They don’t imagine farms or farmers. They imagine perhaps nothing at all, their minds being filled to capacity by numbers leading to the bottom line. Though the corporations, by law, are counted as persons, they do not have personal minds, if they can be said to have minds. It is a great oddity that a corporation, which properly speaking has no self, is by definition selfish, responsible only to itself. This is an impersonal, abstract selfishness, limitlessly acquisitive, but unable to look so far ahead as to preserve its own sources and supplies. The selfishness of the fossil fuel industries by nature is self-annihilating; but so, always, has been the selfishness of the agribusiness corporations. Land, as Wes Jackson has said, has thus been made as exhaustible as oil or coal. There is another difference between my grandfather and James B. Duke that may finally be more important than any other, and this was a difference of kinds of pleasure. We may assume that, as a boomer, moving from one chance of wealth to another, James B. Duke wanted only what he did not yet have. If it is true that he was in this way typical of his kind, then his great pleasure was only in prospect, which excludes affection as a motive. He did not participate in the least in what we call “mobility.” He died, after eighty-two years, in the same spot he was born in. He was probably in his sixties when he made the one longish trip of his life. He went with my father southward across Kentucky and into Tennessee. Confronting that purpose, any small farmer is only one, and one lost, among a great multitude of others, whose work can be quickly transformed into a great multitude of dollars. Industrialists and industrial economists have assumed, with permission from the rest of us, that land and people can be divorced without harm. And so it has seemed to me less a choice than a necessity to oppose the boomer enterprise with its false standards and its incomplete accounting, and to espouse the cause of stable, restorative, locally adapted economies of mostly family-sized farms, ranches, shops, and trades. Naïve as it may sound now, within the context of our present faith in science, finance, and technology—the faith equally of “conservatives” and “liberals”—this cause nevertheless has an authentic source in the sticker’s hope to abide in and to live from some chosen and cherished small place—which, of course, is the agrarian vision that Thomas Jefferson spoke for, a sometimes honored human theme, minor and even fugitive, but continuous from ancient times until now. Allegiance to it, however, is not a conclusion but the beginning of thought. The problem that ought to concern us first is the fairly recent dismantling of our old understanding and acceptance of human limits. For a long time we knew that we were not, and could never be, “as gods.” We knew, or retained the capacity to learn, that our intelligence could get us into trouble that it could not get us out of. We were intelligent enough to know that our intelligence, like our world, is limited. We seem to have known and feared the possibility of irreparable damage. But beginning in science and engineering, and continuing, by imitation, into other disciplines, we have progressed to the belief that humans are intelligent enough, or soon will be, to transcend all limits and to forestall or correct all bad results of the misuse of intelligence. Upon this belief rests the further belief that we can have “economic growth” without limit. Economy in its original—and, I think, its proper—sense refers to household management. By extension, it refers to the husbanding of all the goods by which we live. An authentic economy, if we had one, would define and make, on the terms of thrift and affection, our connections to nature and to one another. If a property, say a small farm, has one owner, then the one owner has an effective and assured, if limited, control over it as long as he or she can afford to own it, and is free to sell it or use it, and (I will add) free to use it poorly or well. It is clear also that effective ownership of a small property is personal and therefore can, at least possibly, be intimate, familial, and affectionate. Tate’s essay was written for the anthology, Who Owns America? the publication of which was utterly without effect. With other agrarian writings before and since, it took its place on the far margin of the national dialogue, dismissed as anachronistic, retrogressive, nostalgic, or (to use Tate’s own term of defiance) reactionary in the face of the supposedly “inevitable” dominance of corporate industrialism. Who Owns America? was published in the Depression year of 1936. It is at least ironic that talk of “effective property” could have been lightly dismissed at a time when many rural people who had migrated to industrial cities were returning to their home farms to survive. But now, three-quarters of a century later, we are no longer talking about theoretical alternatives to corporate rule. We are talking with practical urgency about an obvious need. Now the two great aims of industrialism—replacement of people by technology and concentration of wealth into the hands of a small plutocracy—seem close to fulfillment. At the same time the failures of industrialism have become too great and too dangerous to deny. Corporate industrialism itself has exposed the falsehood that it ever was inevitable or that it ever has given precedence to the common good. It has failed to sustain the health and stability of human society. Among its characteristic signs are destroyed communities, neighborhoods, families, small businesses, and small farms. It has failed just as conspicuously and more dangerously to conserve the wealth and health of nature. No amount of fiddling with capitalism to regulate and humanize it, no pointless rhetoric on the virtues of capitalism or socialism, no billions or trillions spent on “defense” of the “American dream,” can for long disguise this failure. The evidences of it are everywhere: eroded, wasted, or degraded soils; damaged or destroyed ecosystems; extinction of species; whole landscapes defaced, gouged, flooded, or blown up; pollution of the whole atmosphere and of the water cycle; “dead zones” in the coastal waters; thoughtless squandering of fossil fuels and fossil waters, of mineable minerals and ores; natural health and beauty replaced by a heartless and sickening ugliness. Perhaps its greatest success is an astounding increase in the destructiveness, and therefore the profitability, of war. In 1936, moreover, only a handful of people were thinking about sustainability. Now, reasonably, many of us are thinking about it. The problem of sustainability is simple enough to state. It requires that the fertility cycle of birth, growth, maturity, death, and decay—what Albert Howard called “the Wheel of Life”—should turn continuously in place, so that the law of return is kept and nothing is wasted. For this to happen in the stewardship of humans, there must be a cultural cycle, in harmony with the fertility cycle, also continuously turning in place. The cultural cycle is an unending conversation between old people and young people, assuring the survival of local memory, which has, as long as it remains local, the greatest practical urgency and value. This is what is meant, and is all that is meant, by “sustainability.” The fertility cycle turns by the law of nature. The cultural cycle turns on affection. That we live now in an economy that is not sustainable is not the fault only of a few mongers of power and heavy equipment. We all are implicated. We all, in the course of our daily economic life, consent to it, whether or not we approve of it. This is because of the increasing abstraction and unconsciousness of our connection to our economic sources in the land, the land-communities, and the land-use economies. In my region and within my memory, for example, human life has become less creaturely and more engineered, less familiar and more remote from local places, pleasures, and associations. Our knowledge, in short, has become increasingly statistical. Statistical knowledge once was rare. It was a property of the minds of great rulers, conquerors, and generals, people who succeeded or failed by the manipulation of large quantities that remained, to them, unimagined because unimaginable: merely accountable quantities of land, treasure, people, soldiers, and workers. This is the sort of knowledge we now call “data” or “facts” or “information.” Or we call it “objective knowledge,” supposedly untainted by personal attachment, but nonetheless available for industrial and commercial exploitation. By means of such knowledge a category assumes dominion over its parts or members. With the coming of industrialism, the great industrialists, like kings and conquerors, become exploiters of statistical knowledge. And finally virtually all of us, in order to participate and survive in their system, have had to agree to their substitution of statistical knowledge for personal knowledge. Virtually all of us now share with the most powerful industrialists their remoteness from actual experience of the actual world. Like them, we participate in an absentee economy, which makes us effectively absent even from our own dwelling places. Though most of us have little wealth and perhaps no power, we consumer–citizens are more like James B. Duke than we are like my grandfather. By economic proxies thoughtlessly given, by thoughtless consumption of goods ignorantly purchased, now we all are boomers. 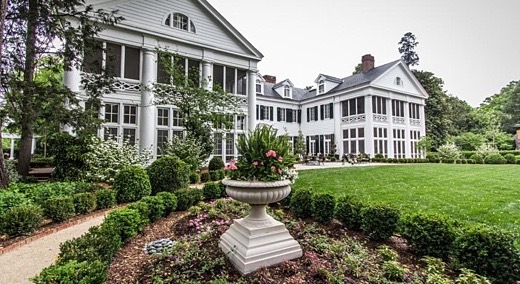 Image above: The Duke Mansion in Charlotte, North Carolina, is now a hotel. From (http://www.booking.com/hotel/us/the-duke-mansion.html). The failure of imagination that divided the Duke monopoly and such farmers as my grandfather seems by now to be taken for granted. James B. Duke controlled remotely the economies of thousands of farm families. A hundred years later, “remote control” is an unquestioned fact, the realization of a technological ideal, and we have remote entertainment and remote war. Statistical knowledge is remote, and it isolates us in our remoteness. It is the stuff itself of unimagined life. We may, as we say, “know” statistical sums, but we cannot imagine them. It is by imagination that knowledge is “carried to the heart” (to borrow again from Allen Tate).5 The faculties of the mind—reason, memory, feeling, intuition, imagination, and the rest—are not distinct from one another. Though some may be favored over others and some ignored, none functions alone. But the human mind, even in its wholeness, even in instances of greatest genius, is irremediably limited. Its several faculties, when we try to use them separately or specialize them, are even more limited. When people succeed in profiting on a large scale, they succeed for themselves. When they fail, they fail for many others, sometimes for us all. A large failure is worse than a small one, and this has the sound of an axiom, but how many believe it? Propriety of scale in all human undertakings is paramount, and we ignore it. We are now betting our lives on quantities that far exceed all our powers of comprehension. We believe that we have built a perhaps limitless power of comprehension into computers and other machines, but our minds remain as limited as ever. Our trust that machines can manipulate to humane effect quantities that are unintelligible and unimaginable to humans is incorrigibly strange. As there is a limit only within which property ownership is effective, so is there a limit only within which the human mind is effective and at least possibly beneficent. We must assume that the limit would vary somewhat, though not greatly, with the abilities of persons. Beyond that limit the mind loses its wholeness, and its faculties begin to be employed separately or fragmented according to the specialties or professions for which it has been trained. But as I understand this dilemma, we are not completely isolated. Though we cannot by our own powers escape our limits, we are subject to correction from, so to speak, the outside. I can hardly expect everybody to believe, as I do (with due caution), that inspiration can come from the outside. But inspiration is not the only way the human enclosure can be penetrated. Nature too may break in upon us, sometimes to our delight, sometimes to our dismay. As many hunters, farmers, ecologists, and poets have understood, Nature (and here we capitalize her name) is the impartial mother of all creatures, unpredictable, never entirely revealed, not my mother or your mother, but nonetheless our mother. If we are observant and respectful of her, she gives good instruction. As Albert Howard, Wes Jackson, and others have carefully understood, she can give us the right patterns and standards for agriculture. To hear of a thousand deaths in war is terrible, and we “know” that it is. But as it registers on our hearts, it is not more terrible than one death fully imagined. The economic hardship of one farm family, if they are our neighbors, affects us more painfully than pages of statistics on the decline of the farm population. I can be heartstruck by grief and a kind of compassion at the sight of one gulley (and by shame if I caused it myself), but, conservationist though I am, I am not nearly so upset by an accounting of the tons of plowland sediment borne by the Mississippi River. Wallace Stevens wrote that “Imagination applied to the whole world is vapid in comparison to imagination applied to a detail”9—and that appears to have the force of truth. Yet another not very stretchable human limit is in our ability to tolerate or adapt to change. Change of course is a constant of earthly life. You can’t step twice into exactly the same river, nor can you live two successive moments in exactly the same place. And always in human history there have been costly or catastrophic sudden changes. But with relentless fanfare, at the cost of almost indescribable ecological and social disorder, and to the almost incalculable enrichment and empowerment of corporations, industrialists have substituted what they fairly accurately call “revolution” for the slower, kinder processes of adaptation or evolution. We have had in only about two centuries a steady and ever-quickening sequence of industrial revolutions in manufacturing, transportation, war, agriculture, education, entertainment, homemaking and family life, health care, and so-called communications. Probably everything that can be said in favor of all this has been said, and it is true that these revolutions have brought some increase of convenience and comfort and some easing of pain. It is also true that the industrialization of everything has incurred liabilities and is running deficits that have not been adequately accounted. All of these changes have depended upon industrial technologies, processes, and products, which have depended upon the fossil fuels, the production and consumption of which have been, and are still, unimaginably damaging to land, water, air, plants, animals, and humans. And the cycle of obsolescence and innovation, goaded by crazes of fashion, has given the corporate economy a controlling share of everybody’s income. For this also there is no technological or large-scale solution. Perhaps, as they believe, the most conscientiously up-to-date people can easily do without local workshops and stores, local journalism, a local newspaper, a local post office, all of which supposedly have been replaced by technologies. But what technology can replace personal privacy or the coherence of a family or a community? What technology can undo the collateral damages of an inhuman rate of technological change? The losses and damages characteristic of our present economy cannot be stopped, let alone restored, by “liberal” or “conservative” tweakings of corporate industrialism, against which the ancient imperatives of good care, homemaking, and frugality can have no standing. The possibility of authentic correction comes, I think, from two already-evident causes. The first is scarcity and other serious problems arising from industrial abuses of the land-community. The goods of nature so far have been taken for granted and, especially in America, assumed to be limitless, but their diminishment, sooner or later unignorable, will enforce change. A positive cause, still little noticed by high officials and the media, is the by now well-established effort to build or rebuild local economies, starting with economies of food. This effort to connect cities with their surrounding rural landscapes has the advantage of being both attractive and necessary. It rests exactly upon the recognition of human limits and the necessity of human scale. Its purpose, to the extent possible, is to bring producers and consumers, causes and effects, back within the bounds of neighborhood, which is to say the effective reach of imagination, sympathy, affection, and all else that neighborhood implies. In this age so abstracted and bewildered by technological magnifications of power, people who stray beyond the limits of their mental competence typically find no guide except for the supposed authority of market price. “The market” thus assumes the standing of ultimate reality. But market value is an illusion, as is proven by its frequent changes; it is determined solely by the buyer’s ability and willingness to pay. By now our immense destructiveness has made clear that the actual value of some things exceeds human ability to calculate or measure, and therefore must be considered absolute. For the destruction of these things there is never, under any circumstances, any justification. Their absolute value is recognized by the mortal need of those who do not have them, and by affection. Land, to people who do not have it and who are thus without the means of life, is absolutely valuable. Ecological health, in a land dying of abuse, is not worth “something”; it is worth everything. And abused land relentlessly declines in value to its present and succeeding owners, whatever its market price. By now all thoughtful people have begun to feel our eligibility to be instructed by ecological disaster and mortal need. But we endangered ourselves first of all by dismissing affection as an honorable and necessary motive. Our decision in the middle of the last century to reduce the farm population, eliminating the allegedly “inefficient” small farmers, was enabled by the discounting of affection. As a result, we now have barely enough farmers to keep the land in production, with the help of increasingly expensive industrial technology and at an increasing ecological and social cost. Far from the plain citizens and members of the land-community, as Aldo Leopold wished them to be, farmers are now too likely to be merely the land’s exploiters. I don’t hesitate to say that damage or destruction of the land-community is morally wrong, just as Leopold did not hesitate to say so when he was composing his essay, “The Land Ethic,” in 1947. But I do not believe, as I think Leopold did not, that morality, even religious morality, is an adequate motive for good care of the land-community. The primary motive for good care and good use is always going to be affection, because affection involves us entirely. And here Leopold himself set the example. In 1935 he bought an exhausted Wisconsin farm and, with his family, began its restoration. To do this was morally right, of course, but the motive was affection. Leopold was an ecologist. He felt, we may be sure, an informed sorrow for the place in its ruin. He imagined it as it had been, as it was, and as it might be. And a profound, delighted affection radiates from every sentence he wrote about it. In thinking about the importance of affection, and of its increasing importance in our present world, I have been guided most directly by E. M. Forster’s novel, Howards End, published in 1910.
o have beautiful buildings, for example, people obviously must want them to be beautiful and know how to make them beautiful, but evidently they also must love the places where the buildings are to be built. For a long time, in city and countryside, architecture has disregarded the nature and influence of places. Buildings have become as interchangeable from one place to another as automobiles. The outskirts of cities are virtually identical and as depressingly ugly as the corn-and-bean deserts of industrial agriculture. What Forster could not have foreseen in 1910 was the extent of the ugliness to come. We still have not understood how far at fault has been the prevalent assumption that cities could be improved by pillage of the countryside. But urban life and rural life have now proved to be interdependent. As the countryside has become more toxic, more eroded, more ecologically degraded and more deserted, the cities have grown uglier, less sustainable, and less livable. But she is not a feminist in the popular or political sense. What she opposes with all her might is Henry’s hardness of mind and heart that is “realistic” only because it is expedient and because it subtracts from reality the life of imagination and affection, of living souls. She opposes his refusal to see the practicality of the life of the soul. The great reassurance of Forster’s novel is the wholeheartedness of his language. It is to begin with a language not disturbed by mystery, by things unseen. But Forster’s interest throughout is in soul-sustaining habitations: houses, households, earthly places where lives can be made and loved. In defense of such dwellings he uses, without irony or apology, the vocabulary that I have depended on in this talk: truth, nature, imagination, affection, love, hope, beauty, joy. Those words are hard to keep still within definitions; they make the dictionary hum like a beehive. But in such words, in their resonance within their histories and in their associations with one another, we find our indispensable humanity, without which we are lost and in danger. No doubt there always will be some people willing to do anything at all that is economically or technologically possible, who look upon the world and its creatures without affection and therefore as exploitable without limit. Culture, so isolated, is seen either as a dead-end academic profession or as a mainly useless acquisition to be displayed and appreciated “for its own sake.” This definition of culture as “high culture” actually debases it, as it debases also the presumably low culture that is excluded: the arts, for example, of land use, life support, healing, housekeeping, homemaking. But I would insist that the economic arts are just as honorably and authentically refinable as the fine arts. And so I am nominating economy for an equal standing among the arts and humanities. I mean, not economics, but economy, the making of the human household upon the earth: the arts of adapting kindly the many human households to the earth’s many ecosystems and human neighborhoods. This is the economy that the most public and influential economists never talk about, the economy that is the primary vocation and responsibility of every one of us. Image above: A detail of the pool area of the Doris Duke mansion Shangri La on Oahu, Hawaii, is a reproduction of a Persian prince's home. Doris Duke was the daughter of J. B. Duke, and when she built this home she was the richest woman in the world. She spent much of her adult life collecting Islamic art. From (http://www.shangrilahawaii.org/).